Protected: Practical limitations of slope angle shading for route planning in avalanche terrain. https://mountwashingtonavalanchecenter.org/wp-content/uploads/2018/12/mwaclogo.png 0 0 fongemie https://mountwashingtonavalanchecenter.org/wp-content/uploads/2018/12/mwaclogo.png fongemie2019-02-24 12:58:102019-04-09 08:07:10Practical limitations of slope angle shading for route planning in avalanche terrain. Terrain around Mount Washington continues to collect snow with snowfields increasing in size. Some avalanche paths are growing rapidly while others still continue to harbor more rocks and brush than snow. While snowfields are growing, most avalanche paths are not quite fully developed. Traditional start zones have not yet filled in, but smaller avalanches are occurring in areas that have enough snow. These same areas are the places getting attention from skiers and climbers. With the early season stoke in high effect at the moment and many people trying to ski and climb, it’s important to remember the basics: travel one at a time and make use of safe zones, avoid skiing or climbing under or above another party, and bring your avalanche rescue gear. Rocks, trees and bushes lurk in the snow and in the fall line. Skiing or sliding into obstacles can ruin your day or worse. New snow may just barely cover a season ending stump or boulder. Terrain traps and cliffs make burial and significant injury a real possibility, heightening the consequences of a fall or small avalanche. Long sliding falls are a threat despite the appearance of new, soft snow on your approach. Wind can easily scour parts of your climb or hike down to a hard bed surface. What you thought would be a mellow snow climb can turn into something much more exciting. Consider using a rope in third class terrain or sooner than normal due to the slick surface. • Safe travel in avalanche terrain requires training and experience. This bulletin is just one tool to help you make your own decisions in avalanche terrain. You control your own risk by choosing where, when, and how you travel. • Anticipate a changing avalanche danger when actual weather differs from the higher summits forecast. For more information contact the Forest Service Snow Rangers, the AMC at the Pinkham Notch Visitor Center, or the caretakers at Hermit Lake Shelters. • Posted 7:00 AM, Wednesday, November 21, 2018. A new bulletin will be issued when conditions warrant. View from Lion Head trail above Right Gully as Snow Rangers approached the scene. 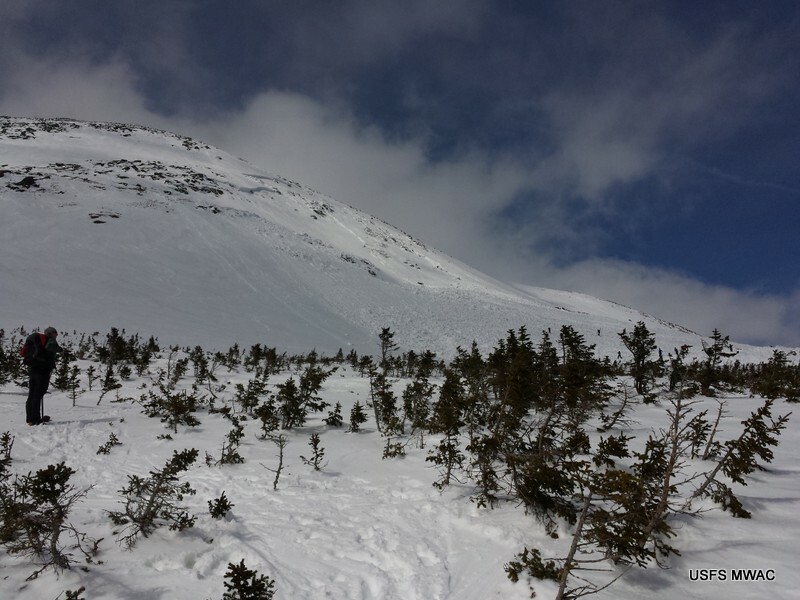 On March 29, 2014, USFS Snow Rangers received a radio call from the Harvard Mountaineering Club caretaker that a large avalanche occurred on the Southeast slope of the “Summit Cone” of Mount Washington. Weather conditions on this Saturday were in and out of the clouds with temperatures around 30F . 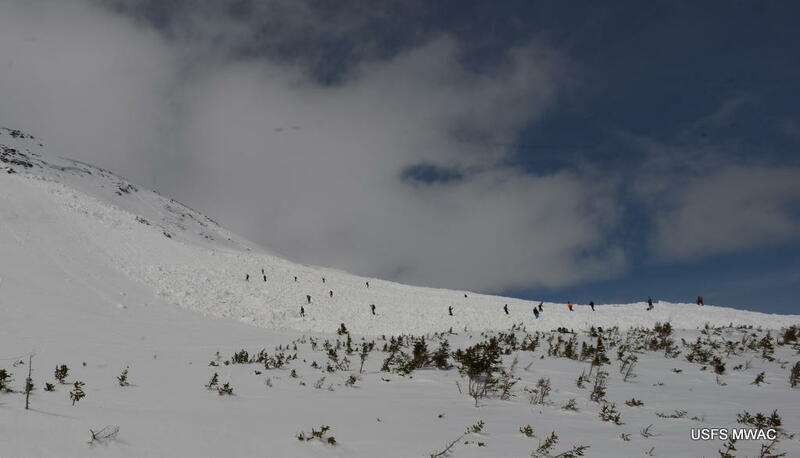 Being the first nice day after an otherwise unseasonably cold winter, there were dozens of skiers making their way into Tuckerman Ravine with some parties heading on to the summit snowfields. This area is not forecasted by the avalanche center however, the avalanche hazard posted for the day in Tuckerman and Huntington Ravine was Moderate with the primary concern being wet slabs. Persistent slabs were listed as problem number two with a reference contained in the snowpack discussion about the rating being a “scary moderate”. The avalanche was triggered by one of two parties skiing nearby at approximately 1pm. 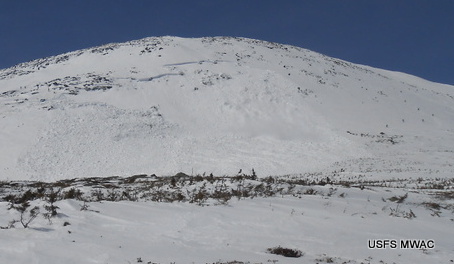 This avalanche was unusual in that this slope, as well as the nearby East Snowfields, rarely avalanches, or more accurately, is rarely witnessed to avalanche, despite a slope angle capable of producing a slide. Small avalanches are occasionally triggered near Split Rock on the Lion Head trail but an avalanche of this magnitude anywhere on the summit cone is exceptional. Prior Snow Ranger Brad Ray, whose work in the Ravines dated back to the early 60’s, confirmed that this avalanche is larger by far than any other avalanche he was aware of in this location. Several factors probably contribute to the lack of avalanche activity here including an abundance of large boulders to serve as anchors, a snowpack which is typically hammered into hard wind slab by high winds as well as relatively few skiers and climbers to serve as triggers during the mid-winter. 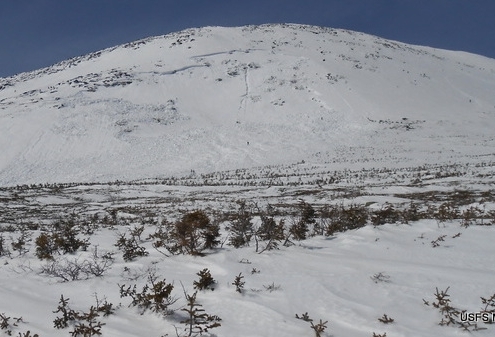 Mid-winter natural avalanches that may occur may also go unseen, but this slope fits all the parameters required for avalanching. In this case, mitigating factors were not in play. Heavy snowfall in the month of March buried many of the boulders in the middle of the track which might have served as anchors. The buried weak layer of small facets beneath the ice crust was generally buried deeply in many locations, out of reach of the impact of ski or foot traffic. And while this weak layer was scoured out of many steeper slopes of Tuckerman and Huntington by avalanches earlier in the season, to our knowledge, the Southeast snowfield had not avalanched, or seen much ski traffic, until this day. The avalanche shortly after intiation. Note the party of 5 in the upper left and the party of 8 skinning uphill to the right. The photos in this series, taken by an MWOBS volunteer, show the proximity of two groups to the avalanche and the flow of debris. Conversations with one of the skiers seen low and to the right of the avalanche is one of the factors that leads us to believe that the avalanche was remotely triggered. The skier interviewed, a former HMC caretaker stated that he felt a collapse followed by a much louder, widespread collapse. The party then turned to see the toe of the slope behind them ripple as it compressed and then watched as the slope collapsed. Snow temperatures at a snow profile on the right flank helped rule out heating of the slab as the primary factor temperatures at the crust facet layer. Temperature at the crust was -5C with all but the surface layer dry and cold. It is also possible that the party near the upper left corner of the crown line may have triggered the slab but they were not interviewed on this matter. Note the gouge left by the boulder. The events leading up to the triggering of the avalanche were pieced together by USFS Snow Rangers from eyewitness accounts of parties on or near the slope. A group of volunteers who had been out for a walk from the MWOBS, happened to capture on camera the avalanche in motion. Immediately following the avalanche, nearby parties completed avalanche beacon signal searches. Parties nearby also accounted for members of their own parties but concerns for the whereabouts of a party of sledders (plastic toy toboggans not snowmobiles) was in question, as well as nagging concerns that some small party may have been in the area and gone unnoticed. Unfortunately, it is not unusual to see people travelling alone on Mt. 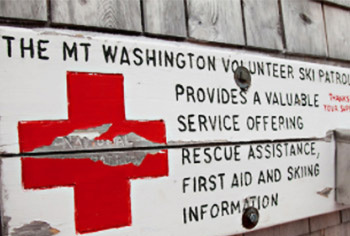 Washington, in avalanche terrain, so the need for a search effort was acted on. 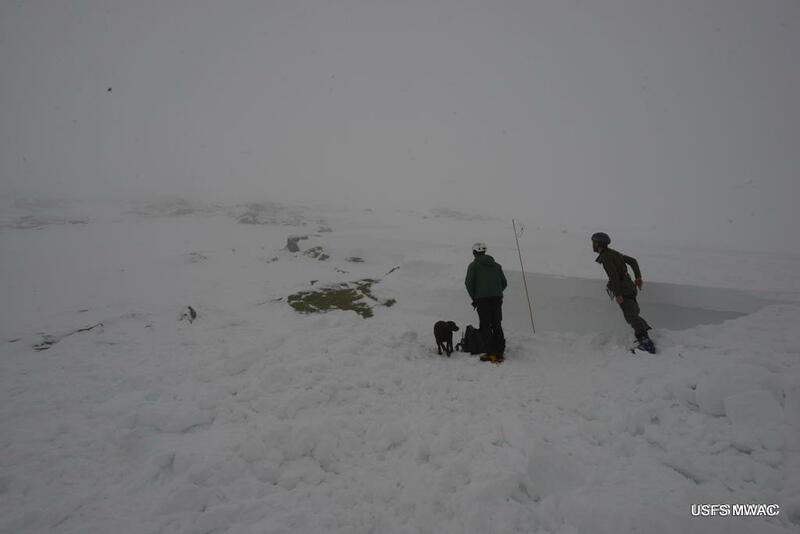 Two USFS Snow Rangers responded from Tuckerman Ravine with an avalanche search dog. Efforts to search were still underway on their arrival with a large group probing on the debris field. Due to the risk of a second avalanche from hangfire, Forest Service Snow Rangers reassembled the group off of the debris, posted a lookout above the slope and staged resources for rescue efforts should another avalanche occur. Further interviews were performed and it was determined to be unlikely that a person was caught. Regardless, a dog search continued and soon, another organized scuff search was performed for any clues that may have been previously overlooked. Not long after more detailed searching began, the photos of the avalanche in motion were studied and the potential for buried victims was ruled out. Early stage of initial search efforts by volunteers. The depth of debris, which came to rest after a vertical fall of 390’, was deposited deeply at the transition to the lower angled Alpine Garden. Debris deposit estimates range around 20 feet in depth in the deepest areas and consisted generally of blocky hard slabs of snow riddled with voids of softer snow or just holes. Due to the short track of the avalanche, it did not reach speeds capable of generating the kind of turbulence which would mix the debris and deposit it in a more solid mass typical of most slab avalanches. The avalanche crown averaged 1m thick, perhaps up to 1.4m in places, 200m across and was composed of 4 or more distinct pencil hard slabs. Vertical fall was 390’ with a track of 850’. 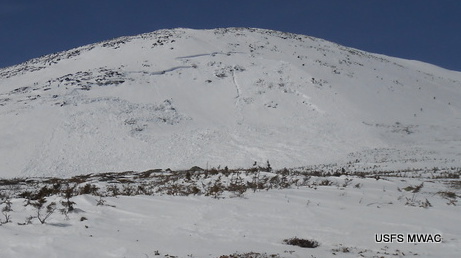 The weak layer in the snowpack consisted of faceted snow beneath an ice crust which developed during the cold weather following a rain event on January 11.This crust and facet layer was the culprit of several avalanche cycles in Tuckerman Ravine, and Huntington Ravine to a lesser extent, over the span of months since its development. Due to deteriorating visibility, only a cursory snow profile was completed. The nature of the deep, persistent slab avalanche hazard is such that it requires some stress to trigger. 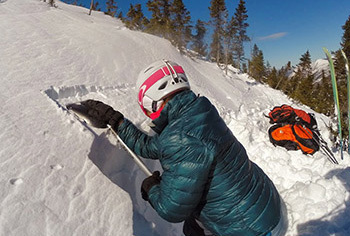 The weight of new snow, rain, or a skier can stress the harder slab of snow over the weak layer until fractures, possibly leading to slope failure. It is important to recognize that the rocks in a slope with this sort of avalanche problem begin to serve as trigger points or perforations in an otherwise strong slab of snow once the snow depth reaches a certain tipping point. Snow Ranger speaking with a member of the party reporting the collapse. A quick snow profile was performed here on the right flank before clouds closed in. 1) Use available resources such as avalanche advisories and weather reports as a tool. However you need to make your own assessments and independent decisions as you travel. At least basic avalanche education is highly recommended for anyone playing in the mountains in winter. 2) It is still winter in the mountains with all the hazards that go along with that season. Spring hazards are emerging too. Check this website daily for advisories and changing hazards. 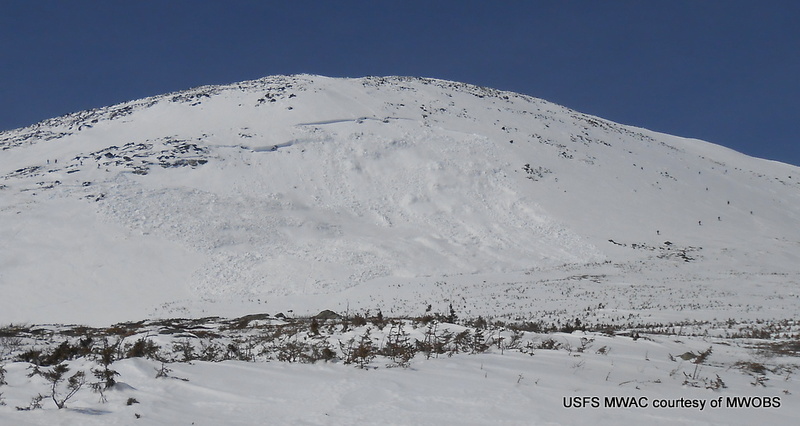 3) The summit cone is not in our forecast area but the avalanche problem that caused this avalanche was in our advisory for Tuckerman and Huntington. See #1 above. 4) Please report an avalanche if you witness one. Rescue efforts require significant effort, potential risks and may divert resources from other incidents so gather as much information as you safely can.